The Toronto Dingos played their second match of the season this past Saturday, squaring off against the Broadview Hawks in Round 3 of the 2017 AFL Ontario season. 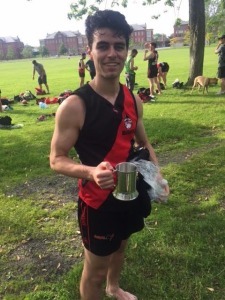 Following a solid showing in Guelph the week before, the Red and Black were looking to build on their success and put a good showing in against their old 2013 Grand Final rivals. The two squared off in the late Saturday game, enjoying a bit of relief from the sun as the clouds rolled in after 4:00pm and just a light breeze occasionally kicking up. The match kicked off fairly evenly, with goals traded back and forth according to the script of each team. For the Hawks, their attack flowed through their big guns, and while Pat Bossey and Stephen Donnelly fought to contain their tags, the Hawks worked the pill with strong leads and high marks, forcing the Dingo backline to work for every spoil. The Red and Black countered with a mobile and athletic forward line, as Ricky Nolan and Thomas Santibanez-Espinosa raced around fighting for crumbs and Geoff Hansen ran long, hard leads for the midfielders to deliver to. Michael Ladd and Steven Speers once again were crucial to the Dingo attack - if they were able to collect ruckman Tom Bell’s taps and push it forward, the Dingos were in business, but a persistent and physical Hawks midfield made that a struggle as the game wore on. Unfortunately for the Red and Black, the game took a decisive turn halfway through the 3rd quarter, as the Hawks lifted their level of play and expanded a 1 or 2 goal margin to a mountainous 5+ goal margin. With the legs lacking gas and the backline getting constantly peppered with incoming deliveries, the scoreboard exploded against the Red and Black, and what was a fairly even game through the first half quickly got out of hand by the final siren. The Dingos will look to regroup in Week 4, as they face the Etobicoke Kangaroos in their annual Friday night game at Humber South.